The Dividist Papers: Is Iraq like Vietnam? Dubious history. Is Iraq like Vietnam? Dubious history. In the last post, we examined the question "Is Iraq like Vietnam?" , concluding it is the wrong question to ask about our involvement in Iraq. In the next two posts we address the President's analogy directly. Contrary to the President's assertion, it is indeed a "mistakable" legacy, dubious history, and a poor analogy. Particularly if this assertion is meant to communicate, as has been asserted by many bloggers and columnists, that the 1975 Congressional vote to cutoff funding for Vietnam was the primary cause of the death of millions of Cambodians at the hands of the murderous Khmer Rouge regime. The first step in deconstructing the President's version of history, is to separate the Vietnamese and Cambodian horrors that followed our withdrawal. For the purposes of this post, we will stipulate that a direct consequence of the 1975 vote was hundreds of thousands of Vietnamese displaced, killed, and imprisoned after Saigon fell. These were the 'boat people' and victims of 're-education' camps' that the President references. It did happen but it did not have to happen that way. We could have planned better to support those who supported us. But as bad as it was, it still must be seen in the context of a fifteen year war, where two to three million Vietnamese and 52,000 Americans lost their lives. Such is the grisly calculus of war. Continuing American involvement after 1973 or 1975 does not mean that fewer Vietnamese lives or even the lives of our Vietnamese supporters would have been lost. After 15 years of American involvement in the fighting in Vietnam, it is hard to imagine how a better outcome would have resulted from an additional two or five or ten or fifteen more years of American intervention, as implied by this speech. Nevertheless, what happened in Vietnam after the fall of Saigon happened to our shame. But the blame does not fall exclusively on the shoulder of the Democratic Congress that voted to cut off funds. That guilt must also be shared by the Republican Commander-in-Chief, Secretary of State, and administration that set the wheels in motion for that vote and its consequences. Nixon: But it'll worry them. Kissinger: But it will worry everybody. And domestically in the long run it won't help us all that much because our opponents will say we should've done it three years ago. Kissinger: So we've got to find some formula that holds the thing together a year or two, after which-- after a year, Mr. President, Vietnam will be a backwater. If we settle it, say, this October, by January '74 no one will give a damn. Actual events did not stay precisely on Kissinger's schedule. This conversation took place in August, 1972. The Paris Peace Accord was signed five months later in January, 1973. Saigon fell a little over two years later, in April, 1975. Duplicity and domestic political gamesmanship by a Republican President and his Secretary of State set the timetable for the fall of Saigon. The Democratic Congress was an accessory to the crime. There is plenty of blame to go around. "He said Kissinger, who served in the Nixon and Ford administrations, has been telling Bush and Cheney that 'in Iraq', he declared very simply, 'Victory is the only meaningful exit strategy.' This is so fascinating. Kissinger's fighting the Vietnam War again because, in his view, the problem in Vietnam was we lost our will." "If you mean, by 'military victory,' an Iraqi government that can be established and whose writ runs across the whole country, that gets the civil war under control and sectarian violence under control in a time period that the political processes of the democracies will support, I don't believe that is possible." I found no comfort in learning that Henry Kissinger was also advising this administration, but I digress. Back to the President's dubious history lesson. Let us start with few indisputable facts. In 1975 a Democratically controlled Congress voted to cutoff funding for Vietnam. That is a fact. Later that year Saigon fell to the North Vietnamese Army. That is a fact. In 1975-79 as many as two million Cambodians died at the hands of their own government under the despotic hand of Pol Pot's Khmer Rouge government. That is fact. The fallacy is stopping with those facts and ignoring others when drawing the conclusion that the Congressional vote in 1975 is responsible for the death of two million Cambodians. The bloggers linked above do not stop there, but claim that Congress cutting off funding for Vietnam in 1975 is pretty much responsible for every bad thing that has happened in the world since 1975, including the Iranian hostage crisis, both Iraq wars, Saddam Hussein, 9/11, Valdimir Putin's poor fishing technique, and Rex Grossman unable to hold on to the football in last years Superbowl, et.al. In 1975 Congress voted to cutoff funding for Vietnam that ultimately led to the death of two million Cambodians in 1975 -79 at the hands of the Khmer Rouge government. 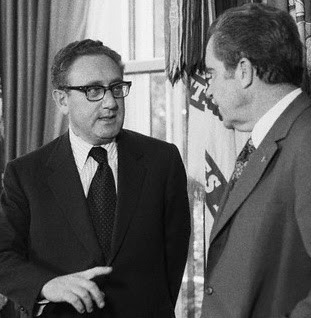 In 1972 President Nixon and Henry Kissinger planned a withdrawal they knew would lead to the failure of the South Vietnamese government and ultimately led to the death of two million Cambodians in 1975 -79 at the hands of the Khmer Rouge government. In 197o Cambodian leader Prince Sihaounok was deposed by pro-American general Lon-Nol in a coup widely understood to have been engineered by the CIA. He was perceived as an American puppet further fueling the Khmer Rouge insurgency which ultimately led to the death of two million Cambodians in 1975 -79 at the hands of the Khmer Rouge government. In 1969 President Nixon ordered the carpet bombing of supply lines in Cambodia, with over 540,000 tons of American bombs killing between 140,000 and 500,000 civilians, fueling popular Cambodian support for the Khmer Rouge that ultimately led to the death of two million Cambodians in 1975 -79 t the hands of the Khmer Rouge government. In 1968 with 25,000 American dead in Vietnam, SECDEF Robert MacNamara, the architect of the Vietnam war, quit or was fired after informing LBJ that the war was not winnable. He chose to not share that insight with the American people until writing his memoirs some 30 years later. As a consequence, the war continued for another five years costing 27,000 American lives and ultimately led to the death of two million Cambodians in 1975 -79 at the hands of the Khmer Rouge government. Which of these where most responsible for the Cambodian massacres? Who knows? Yes, there was a bloodbath in Cambodia and there was suffering in Vietnam. But it is not clear that there was a direct causal relationship between the cutoff in funds in 1975 and the bloodbath in Cambodia. It is not clear that we would have or could have prevented the genocide in Cambodia if we stayed. It is easier to make the case that the bloodbath was not a consequence of leaving Vietnam too early (after over a decade of war and 52,000 American lives), but because we left Vietnam too late. Indeed, one can as easily extract a lesson from Vietnam that the risk of a bloodbath increases the longer we stay. There is no historical certainty here. The assertion that the "killing fields" in Cambodia were a consequence of a Congressional vote to cut off funds for Vietnam is bad history, and a false analogy for Iraq. Obviously, if the history itself is wrong, extracting an analogous lesson for Iraq from that falsity is complete fantasy. Does this mean there is no risk of a bloodbath in Iraq should we leave? Of course not. That risk is real. As we begin our withdrawal from Iraq, as we inevitably must, we should strive to do so in a responsible way and minimize the likelihood of a bloodbath. A bloodbath in Iraq is not certain, but there is no guarantee that a bloodbath will not occur. There is no guarantee that we can prevent a bloodbath from happening. For the next and last post in this series, we will revisit the question of what lessons were learned from Vietnam. We will reference the lessons that were researched, codified, and understood by the military strategists that studied that war, and the military leaders who were soldiers in that war. Soldiers like General Colin Powell. Technorati tags: Colin Powell, 1975, Vietnam, George Bush, Iraq, surge, Henry Kissinger, Powell Doctrine. And, very ironically, it was Communist Vietnam which put an end to Pol Pot's abominable regime. Yeah. The whole "enemy of my enemy" meme can lead to very bad decisions. We actually recognized Pol Pot as the legitimate government of Cambodia, because we could not support Communist Vietnam overthrowing the regime. Best lesson from that - "When you are in a hole, stop digging."